Watch this video, and maybe you'll grasp the beauty of a great transit network, a beauty that has nothing to do with the technology it runs, but everything to do with the real life of a city and the feedom of its people. Public transit vehicles moving around Greater Vancouver, an entire day compressed into 2.5 minutes. The original is here. It's by STLTransit, who has done a number of other cities. Long ago I posted another of these, for Auckland, New Zealand. It uses endearing tadpoles instead of white dots. It's also interesting because Auckland's is not a single unified network, as Vancouver's is, (although we're working on it!). You can see the difference if you watch closely, using the tips below. 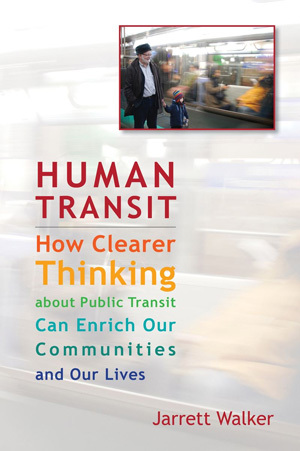 So many people see public transit only as a vehicle on the street, or a thing they're waiting for. But when you watch this video of a well-designed unified transit network, you can see that it's a gigantic interconnected organism. And like all organisms, it's made up of complex but rhythmic motion. That's Phibbs Exchange, an example of strong pulse scheduling. At a langorous pace (representing a pulse every half hour or even every hour) you'll see many white dots gather themselves into a single bright dot, shine brightly for a moment, then "pulse" outward again. What's happening is that many buses that run infrequently are converging on a point and sitting together briefly, so that people can transfer from any bus to any other. I'm not sure I'll ever convey to my non-transit friends that regardless of what you think of buses, a pulse is a beautiful thing to watch. Phibbs is more spread out than I like, and I photographed it at a quiet time of day, but in an ideal one, like the ones in downtown Eugene, you see this gradual gathering of energy to a climax, then a release. Gradually the buses arrive, until finally they're all there. You see signs on the buses announcing different parts of the city, all the places you could go right now, from here. The drivers get off the bus briefly, chat with customers, point them to the right service. People meet by chance. It happens many times a day and yet there's always this sense of event: here, at this moment, you have service to all these different places, ready to go right now. Enjoy the banquet of choices, select your bus, and let's go. In a moment it's over, the buses all gone, the place quiet or even deserted, like a field after a storm has passed. And in half an hour or an hour it will happen again. And it's not a random thing, like a storm, but part of a huge intentional network that (in Vancouver's case) is designed. This pulse is one of the network's many continuous, reliable heartbeats. It's one big organism, made of unconscious rhythmic motion and circulation as all organisms are. It's inseparable from the life of the city it serves. And you're part of it. Jarrett, it is funny that I thought of Phibbs exchange when I read your bit on pulse scheduling! The other thing about Phibbs is the geometry as it is immediately north of the Ironworkers Memorial bridge. A great post. Fascinating. Thankyou. The whole North Vancouver bus network is a complex interrelation of pulses, with buses meeting up in a few places on timed intervals. There are two main pulse centres, Phibbs Exchange at mostly 30-minute headways and Lonsdale Quay at mostly 15-minute headways. There are also buses that run more frequently, and some of them used to run with the pulse. In some ways, the North Vancouver network is over-pulsed. The frequent asynchronous east-west bus that connects the pulses (i.e. in location not in time) at Phibbs Exchange and Lonsdale Quay (and further) has to make long and otherwise unnecessary detours to get to the pulse locations. This bus runs across North Vancouver from Capilano University to Park Royal in about 45 minutes, which is pathetic. Google puts the driving time at 21 minutes on a similar non-detoured route. It takes a few minutes for the bus to make the detour to Phibbs Exchange and about 12 minutes to make the detour to Lonsdale Quay. The kicker is that there is no reason for this bus to go to Lonsdale Quay because its route is duplicated by other pulse-timed routes for all trips in which the Lonsdale Quay-SeaBus route is the fastest way downtown. The most frequent North Vancouver bus spends more than 1/4 its service on an unnecessary detour to a pulse location. That’s represents a good fraction of the network’s resources wasted. The other thing that’s interesting is the contrast between municipalities with and without comprehensible networks. Vancouver’s strong grid of east-west routes spaced 1-2 miles apart and about a dozen north-south routes spaced half a mile apart is readily apparent. The coverage is on the north-south lines and the connections are on the east-west lines. You can see a less frequent but comprehensible network in Richmond, to the south of Vancouver, and in Surrey, below and to the right of the centre of the map. Burnaby and Coquitlam have incomprehensible networks that were put together haphazardly over the years, tweaked a few times, but still make no sense to anyone. Burnaby is the black hole just east of Vancouver, and Coquitlam is the black hole east of Burnaby and north of Surrey. The networks there don’t follow from the arterial grid, nor do they follow from any sensible pulse-based design. These municipalities get a lot of service, it just isn’t used well. These networks weren’t ever designed per se and it shows in the lack of structure. Thanks for the posting, but you know Youtube is blocked in mainland china, is there anyway to download the video from the site other than youtube.com. Truly beautiful for any transport nerd – and for others as well. A wonderful juxtoposition of finely tuned design and harmony. It’s not sufficiently appreciated that presenting something in a different dimension and either speeding up or slowing down gives a whole new view of the network. Like a musician slightly out of tune, change one frequency by a couple of minutes and the whole thing becomes a cacophony. Is there a possibility of putting the thing to sound, with each timed transfers given a tick or beat to make it sound like a giant clock (or more likely a room full of ticking clocks)? The 3 part ‘Timetable beat’ documents some experiments with aural timetables which has some uses in connectivity analysis. Search ‘timetable beat’ in youtube or see http://www.youtube.com/watch?v=zdmI4EwiF3U for Pt 1. I agree that the street network in Burnaby makes it more difficult to design the bus network. It’s not possible to design an evenly spaced and efficient network without some duplication or one-way loops or segments that are mismatched in ridership. That said, Translink has never made any significant attempt to make it better, and there’s a lot of room to make it better. The system that Translink runs today is not efficient. There are a lot of loops, detours, and poorly used routes that run mostly east-west in some pathetic attempt to compete with the SkyTrain. Burnaby has two mostly east-west SkyTrain lines that should connect with a set of as-straight-as-possible north-south bus routes that efficiently cover the municipality. New Westminster doesn’t have an excuse. The place is built for transit, yet it runs a spaghetti network aimed at people who have difficulty walking. Based on its transit network, you’d think that Coquitlam Rec Centre was a place that people actually went to. It’s not, and the transit network is mangled because it. 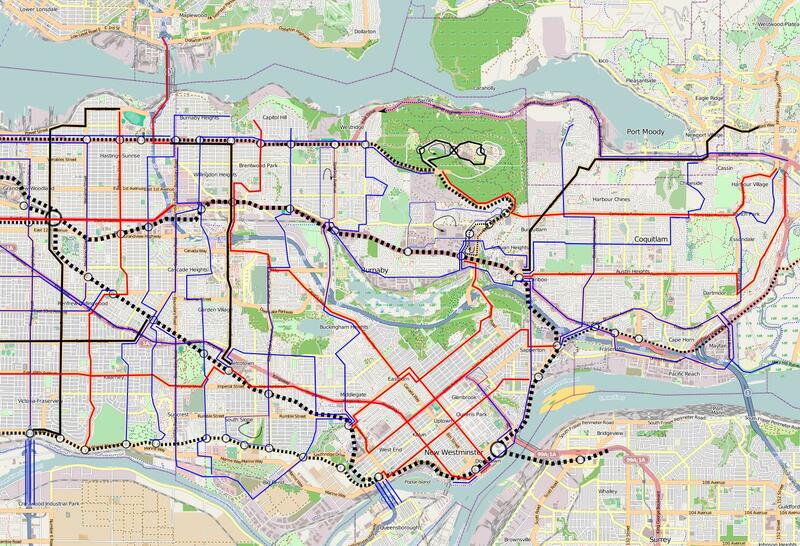 Here’s an attempt at redesigning the East Van-Burnaby-Coquitlam transit network. I don’t like the end-of-route loops, but at least they’re in some of the lowest-density areas. There are two interesting missing pieces to this bus-only video: SkyTrain and the SeaBus. SkyTrain, Metro Vancouver’s automated rapid transit system, runs across much of the region and many of the region’s bus routes intersect with, or originate and terminate at SkyTrain stations. The SeaBus is a passenger ferry that crosses Burrard Inlet and connects downtown Vancouver to the north shore. Many of the pulses of buses that radiate out on the north shore originate at the SeaBus station at Lonsdale Quay and most routes are timed to meet up with an arriving SeaBus and allow passengers time to disembark and make their way out of the floating ferry terminal. Thanks for posting this, Jarrett. As a Swiss citizen who has stayed in North Vancouver for two months its interesting to read this post. We have the same kind of network in Switzerland with our trains. There are a lot of stations (we call them knots or hubs) where a lot of trains meet every half hour. This way you have great connections from every corner of the country to everywhere else. Google “Rail 2000” if you want to find out more. Incidentally, the Edmonton video (https://www.youtube.com/watch?v=9ftHZo7Xpxk&feature=plcp) shows the system’s very strong pulses: see especially the southeast and southwest corners.